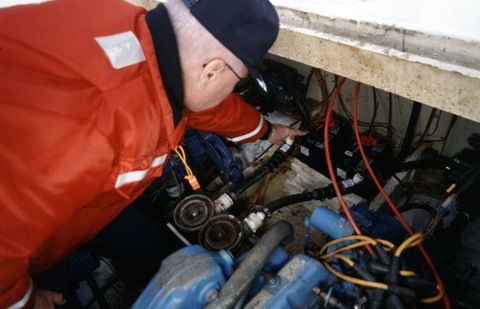 Daily Boater Boating News: Ready Your Engines! We know you're ready for boating season, but is your boat's engine ready? In today's column Vin Pica discusses the "Prevent Defense", or what to do before the engine breaks down! Perhaps non-intuitively, most engine manufacturers will tell you that over-heating is the number one cause of engine problems. Maybe that is a function of coastal mariners having a tendency to find themselves hard aground on sand more often than rocks (see When Your Boat Runs Aground) and that means sand gets up into the raw water intakes. Maybe it is a function of mariners simply not paying attention to how salt and small marine creatures can get up into the fine plumbing of raw water intakes and the connective plumbing. Just like our hearts, a little blockage can do a world of hurt. What to do? Well, how about checking the raw water intakes on your lower unit? When you trim up the engine to keep the barnacles from growing on your prop, take a look at the intakes. If they aren’t shiny clean, clean them and see what might be in there. If you think that something got pushed in while you were cleaning the intake, every engine has a spigot. It is usually integrated with the warm-water tell-tale (where the hot water is released from its engine cooling efforts and returned to sea), which you can remove usually with your fingers and screw a garden hose into its place. Let cold water run through the engine for 10-15 minutes (with the engine off – if there is sand in there, you want to wash it out, not grind it out!) If you wait until your electronic sensor shuts down the engine due to overheating (see Before You Throw in the (Electrical) Towel), it is too late. Most mariners are aware that there are stray currents “naturally” in our waters due to natural electrolysis and due to unnatural stray currents caused by poor electronics at the marina, either due to faulty wiring at the dock or poor grounding in nearby boats (see Atlantic Maritime, Galvanic Corrosion – More Shocking!) In either case, the least “noble” metal, zinc, will be there to be eaten away so your brass propeller isn’t! So check these zincs regularly. And don’t forget about the pencil zincs.